We all know that one way we grow as museum education professionals is by sharing our practices and the thinking that surrounds them. In most cases we do this through traditional presentations: our ideas and experiences tidily packaged; challenges and difficulties presented as something that occurred (safely) in the past, and which we now frame as food for productive reflection. The experimentation and messiness that is so often part of our work — at least if we take the risks necessary to keep evolving — do not often occur in front of our colleagues. 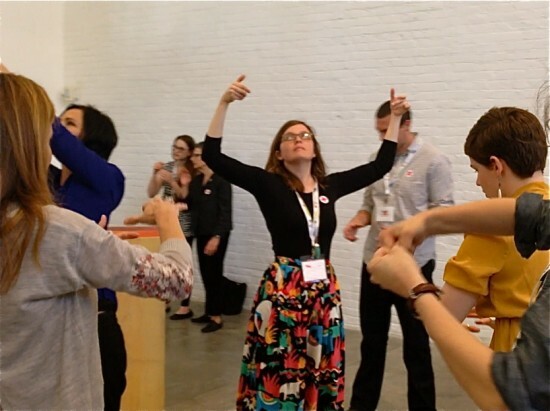 That is, unless we participate in a Gallery Teaching Marathon like the one that took place in the Museum of Contemporary Art San Diego during the NAEA conference this spring. I left the Gallery Teaching Marathon both inspired and hopeful. One important reason was the very nature of the marathon: a group of seasoned museum educators guiding each other in engagements with works of art. Some, by their own admission, did “something they had never tried before;” others shared approaches that had been tried and tested but with works that were new to them. The fact that these educators felt comfortable enough to make themselves vulnerable in front of their colleagues is indicative of extraordinary trust among this community. As well, it reflects the passion and indomitable spirit of a group of professionals who have helped shape our field from the ground up. For those of us who have become accustomed to teaching in the galleries, it was a luxury to be on the audience end of things, with the primary responsibility of helping make meaning of a series of compelling artworks. It was also fascinating to witness a range of teaching approaches that overlapped as much as they were different. I know many of us left the marathon with new ideas — particular strategies that we plan to borrow from our peers, and which will likely be incorporated into our practice soon enough. Participants engaging in movement and pantomime strategies led by Jen Oleniczak. 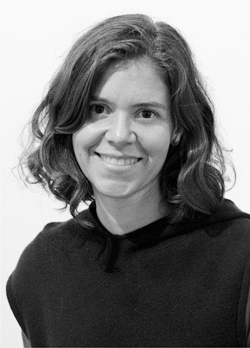 I am ready, for example, to invite viewers to think more explicitly of the layers of meaning that a work might yield (Niki Ciccotelli Stewart), or to encourage them to enact the movements they might make if they could go inside a picture (Jen Oleniczak). I am also keen to have visitors post written questions on the periphery of a work (Heidi Hinish and Liz Diament), or to ask them to do what a particular work “is asking them to do” (Elliott Kai-Kee). More than anything, I am curious to see what happens as other educators in the group borrow and adapt this or that approach, make it their own, and come up with yet other ideas. It is this sort of cross-fertilization that keeps things moving along. Another gain for me was renewed empathy with audiences. Throughout the marathon, I was acutely aware of how I responded to the various conditions that shaped our gallery interactions. When did the pace of a conversation leave room for my comments and when did it seem too fast or too distant from my ideas? In the case of non-discursive activities, when did I feel too self-conscious to really be in the experience and when did I feel comfortable “going for it”? How did the educator’s demeanor influence my interaction with the work and with others in the group? By taking the participant’s seat, I was also able to re-discover something I already knew — or thought I knew. 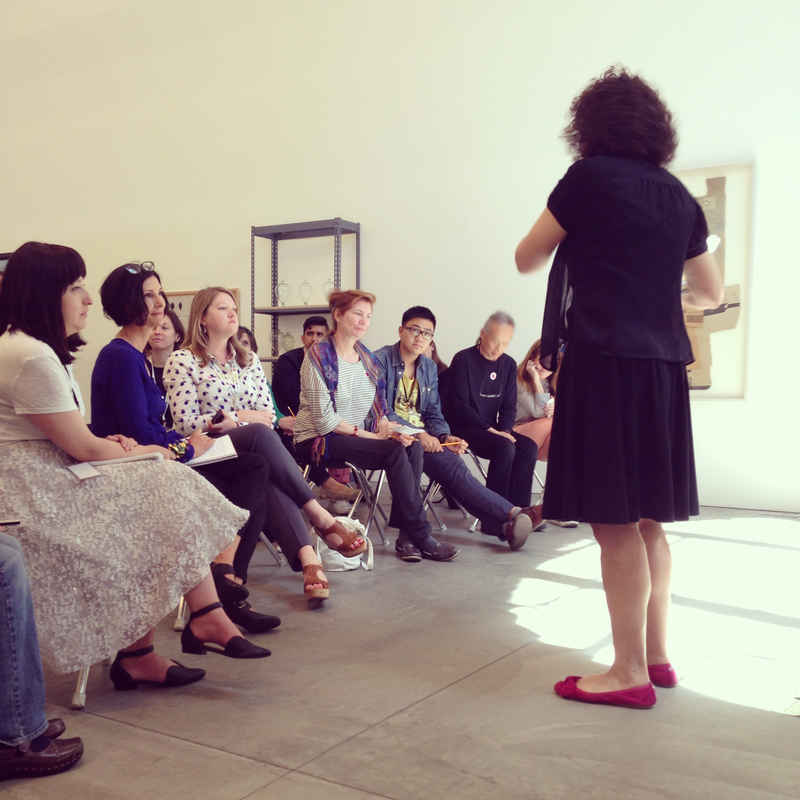 Like all of you, I have known for years that partner talk is a valuable approach in the galleries (of course!). But at MCASD, when a group got too large, or when for whatever reason I did not feel prepared to share my thoughts in a group dialogue, how grateful I was to be able to share what had been in my mind all along with a partner! The next time I facilitate partner- or small-group work I will do so from a renewed level of empathy and awareness. Perhaps like me, some of you also left the marathon with your own “re-learnings,” which can only work to enhance visitors’ experiences in the museum. 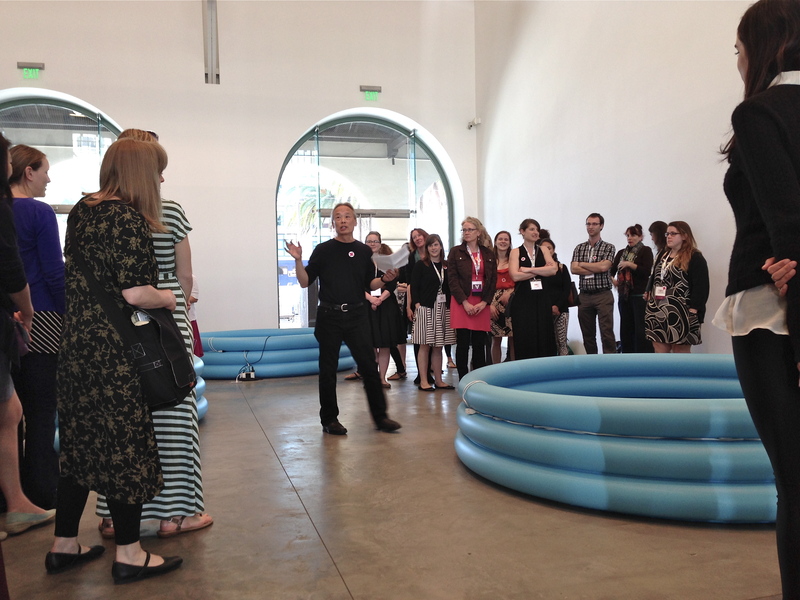 If the experiences that took place in MCASD are in any way representative of the field, it would seem that we have come to accept that the meanings that viewers shape through words and rational thought are no more worthy than those they shape through poetic and non-discursive modalities. In an educational milieu that values rational thinking and word-based forms of meaning making above all, this places us at the vanguard–but also in tension with the status quo. Given this, how might we work to deepen and strengthen a commitment to poetic/artistic and multimodal ways of knowing so that museum visitors can continue to benefit from rich, multidimensional experiences with museum objects? How might we articulate the educational worth of diverse modes of meaning making? And how might we avoid dichotomizing rational, word-based approaches vis-à-vis more poetic ones, which might put us at risk of throwing out the baby with the bath water — or from recognizing when the two intersect? With these and other questions in mind, throughout the marathon, part of me kept wishing for more time to debrief and reflect on what we were all experiencing. The rest of me was content with the limited reflection time we had, however — there was something wonderful about spending an entire day in the midst of practice; a day of sharing our work in the making; our practices in all their messiness and all their (realized and yet-to-be realized) potential. Perhaps an idea for another occasion might be to have a one-day gallery teaching marathon followed by a half-day reflection session. But back to the event at MCASD. Early in this post, I said that the Gallery Teaching Marathon left me hopeful. I meant it. As I think back to our day together, I am hopeful for what is to come for our field, full as it is of courageous and dedicated educators who continue to build from the ground up, and to push us all to think and play and interact in thoughtful, imaginative ways. This is significant work for us as educators, and I trust that in time it will lead to more meaning-full museum experiences for visitors. Thanks for your thoughtful response, Olga (and Elliott). I’m struck by what you said near the top that you left the Marathon feeling both inspired and hopeful. Not only because those are two things I also walked away with, myself, but also because those are two words that I think would probably appear in a lot of museum educators’ lists of how they want their audiences to feel after a museum experience. It’s nice to know that when museum educators take the audience seat and participate in programs–like we did throughout the Marathon–we can take away some of the same things we want our audiences to gain from our work, and that it still happens even when we’re asked to participate in activities that might be beyond the normal bounds of what we do in our regular teaching. On a totally separate note, I’m really curious to know if any of the day’s participants were other NAEA attendees who weren’t museum educators. And perhaps even more curious to know if any were members of the general public who happened to be at MCASD that day and joined in on the fun. I don’t know how it could happen, but I’d love to know what their perspectives were, coming from outside the field. Regarding the poetic and rational approaches, Elliot Kai-Kee asks: Is there a way of thinking about teaching that brings them together in a way that would make them more powerful in combination? It seem to me that when art education and problem-posing (think Paulo Freire) are combined this happens in powerful ways.